Okay it occurred to me I haven't done a post about handbags, i'm a bag-aholic. I love bags. Basically any kind, size, shape, colour, if I like it chances are i'll buy it or just lust after it for a long time. Honestly my love for bags knows no end. Anyway because of this I thought i'd show you my favourite bags. I do own others but these are ones I reach for most often. I do have a little black going-out type bag that I also use a lot but I left it at my parents house so it had to be left out of this post. Anyway my absolute favourite bag of all time is my Mulberry Alexa. (Just to let you know I did not buy this myself, it was a gift for my 23rd birthday, very very generous gift and was a complete surprise and shock, but i'm so grateful). Its gorgeous, its the chocolate soft buffalo and I just love it. Slightly shoddy camera work here as the light was bad, but anyway I love it, the size is perfect, I like larger bags, I hate when you have a small bag and you're trying to squeeze everything you need into them, so this is the perfect size. The detail on this bag is lovely, I love the postman lock and the belt buckle straps. I also like that you can wear it on your arm or on the shoulder with the long strap, which makes it look more casual. 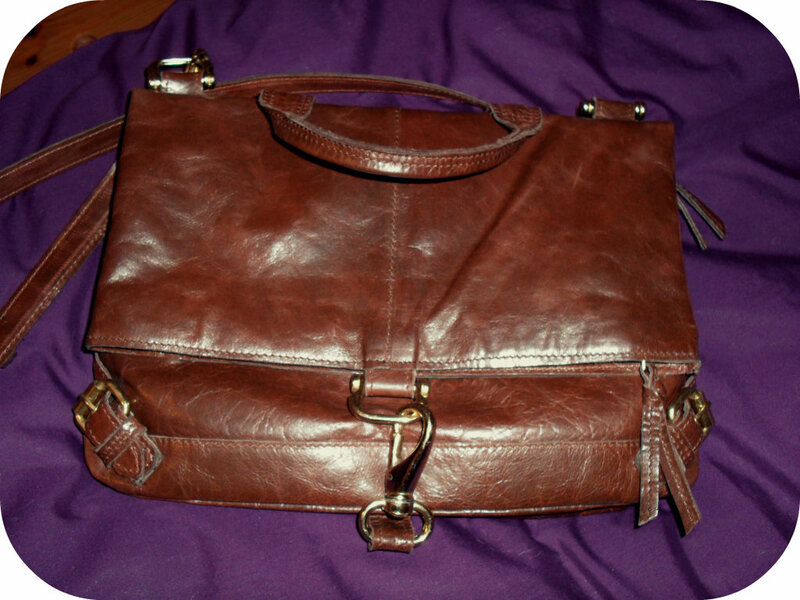 I also love the inside of this bag, its got the classic Mulberry tree lining and its huge inside. 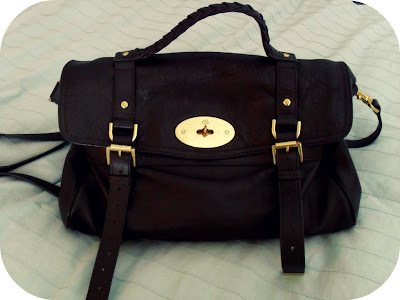 So yes this is my favourite bag and its worn amazingly well, i've had it almost a year now and the quality is unquestionable, you definitely get what you pay for with Mulberry. This bag currently retails for £795, the Mini Alexa is £550 and the Oversized Alexa is £925. So very pricey and not something to be bought just on a whim, but I would save money to buy this bag if I didn't own it already just because I adore it. Okay so moving into high street (i.e my price range!) bags. First of my favourites is this White and Blue fold over bag from River Island. 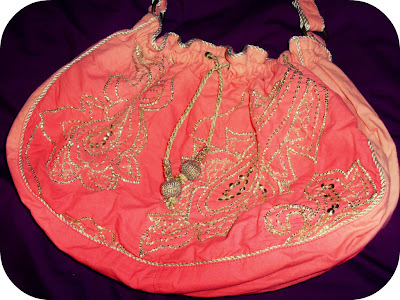 I got this last Summer before going on holiday to Greece as I thought it was the perfect holiday bag. As far as I can remember I think this was £24 which in my opinion is pretty good. I love the silver hardware against the bright blue. 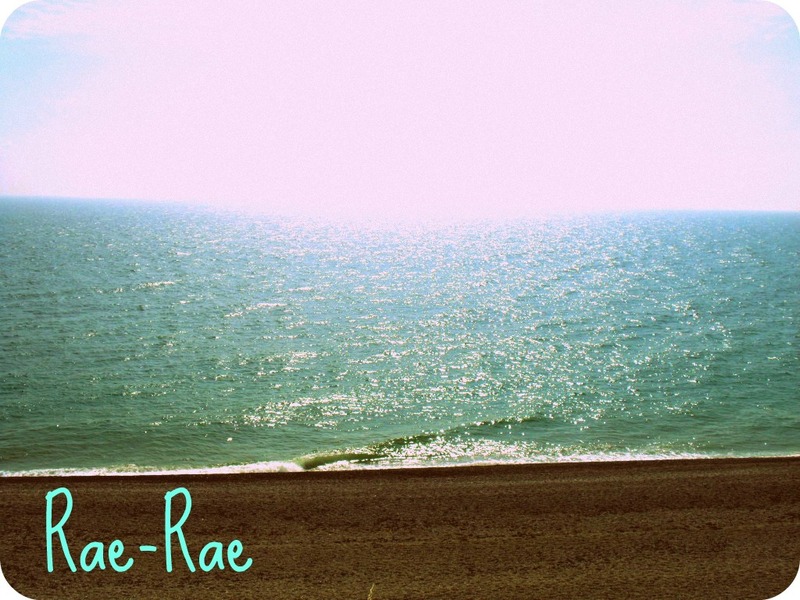 It looks so pretty and summery. It's simple without being dull I think. The blue is definitely what attracted me too it and I love that the lining is the bright blue as well. It has a long strap and the bag folds over in the middle and joins with a magnet hidden under the outer fabric (very clever imo). So yes I used this a lot and as such it is a tad dirty, the only problem with white bags and i'm seriously hoping I can clean it with something, not sure what though, and hopefully it will look as good as new again because I really like this. Also its not too big and its very light even with things in so its good for sightseeing and travelling. I did see one similar to this in River Island today if anyone was interested, couldn't find it online but it may be new season. Next on the list is this dark tan satchel bag from Topshop, this is also a fairly old purchase and was about £40 (overpriced I think but I loved it). Do excuse the clashing purple duvet cover :/. So this is another fold over bag and its on a hinge type clasp (no idea what these are actually called!) but I like that makes it easy to open, and it has a zip so things don't fall out everywhere. This has a long shoulder strap and the size of this makes it perfect for uni as I can get a notepad in it and my pens and other stationery type items in comfortably. I like the details, especially the buckles at the bottom. 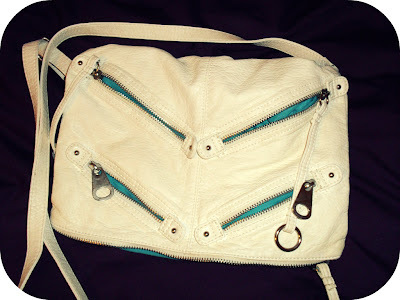 This is just quite a plain casual bag, which is good for all seasons and goes with a lot of different outfits. These bags are sort of timeless i think as satchels always seem to be around, they're just very versatile and I like them for everyday use. Last but not least is this...yes this will not be to everyone's taste as its a bit out there, but I saw this in Accessorize and just fell in love and my lovely mum bought it for my birthday. It was £18.99 I believe. Ah its just lovely, its an amazing coral pink colour which is faded towards the top, and its got this amazing gold sequin detail on it. This is definitely a Summer bag, I wouldn't use this any other time of year as I feel i'd look a tad odd, especially in England where the weather is so bad. Its an over shoulder bag, and it just has a magnet popper close, inside is a cream silky lining and there's just one inside zip pocket but this is perfect as a beach bag. It's nice to wear with white linen trousers or denim shorts and a white vest, well at least that how I like to wear it. But yes Accessorize definitely know how to do a nice Summer bag, they've got some gorgeous bags in store at the moment, so definitely check them out if you're looking for one. I do find they can be overpriced so unless I truely love something, like this one, then I don't tend to buy from there. Anyway those are my most used/favourite bags. Hope you liked this post and are having good days. I also hope the weather is better where you are than where I am...never seen so much rain in my life! 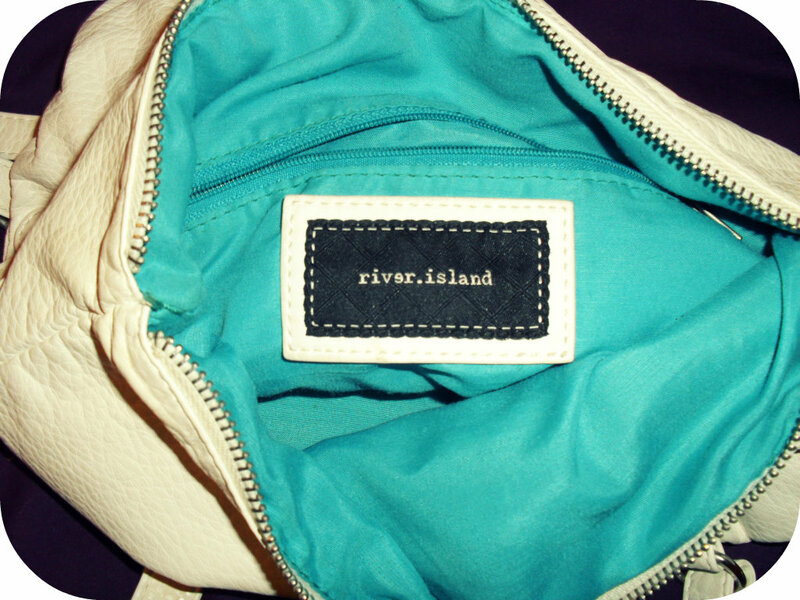 love the river island bag! !